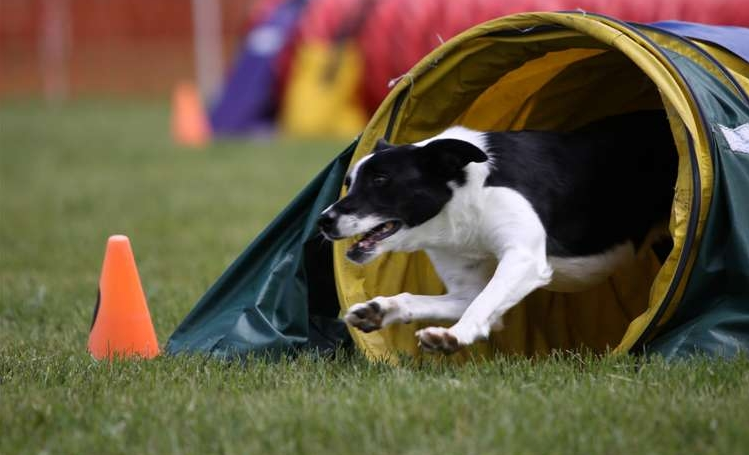 Learning the sport of agility involves more than teaching your dog to perform all of the obstacles on an agility course. The human part of the team must learn to communicate with their dog precisely and consistently. Finally, most handlers have to spend a good bit of time helping their dog get comfortable in the stimulating environments that they will encounter both at agility trials and at agility training sessions. We recommend that dogs and handlers develop some basic skills in obedience as a foundation to prepare them for agility. Basic Obedience I and Basic Obedience II in the GCOC course sequence are a good starting point. Before taking their first agility class, your dog must have a great recall, good sit and stay performance, and be capable of successfully performing these skills in a variety of different environments. We offer two introductory classes in agility, each is offered twice a year: in the Spring and in the Fall. These classes are available to both GCOC members and non-members. Beyond these two classes, all available training is for GCOC members only. This class emphasizes all component skills needed in agility: self control, motivation, balance/coordination, and handling. Dogs and handlers will learn a foundation of safety and skill which will enable them to continue to more advanced agility training if they wish. No prior experience in agility is required. We will introduce you and your dog to the agility obstacles in a positive, safe manner. Learn the tunnel, jumps, table, tire, and learn to perform them with confidence and speed in short sequences. Course also includes foundation skills necessary prior to learning contact obstacles. This class focusses on developing the skills to perform the major contact obstacles safely, accurately, and with speed. Pre-obstacle foundation skills learned in Foundations of Agility are the starting point for building skills on the A-Frame, Dogwalk, and Teeter. In addition, the weave poles will be introduced and students will progress to longer sequences using both contact and non-contact obstacles. At the conclusion of the two introductory agility classes, you have to ask yourself a question: Am I hooked on agility? If the answer is "No", then you have still learned enough to safely have fun with your dog doing agility now and then in the backyard. But, if the answer is "Yes! ", then the Agility Co-operative is the next destination on your journey! What is The Agility Co-operative? The Agility Co-operative is a weekly gathering of GCOC members interested in continually improving their agility skills. Skill levels range from pre-novice to excellent. The more experienced members lead the co-op, choosing courses and challenges each week from CleanRun magazine, the CleanRun Sourcebooks, and/or courses from recent trials. Members of The Agility Co-operative also provide critical help in putting on the two GCOC agility trials each year! To be eligible for The Agility Co-operative, you must be a GCOC member. You and your dog have to be able to safely perform all agility obstacles. Improving accuracy, speed, and consistency on the obstacles can be addressed in the Co-op. You also have to be interested in improving your handling skills. Everyone in the Co-op needs to improve their handling skills! You need to have access to agility equipment during the rest of the week and have the time/interest in practice regularly. For some of us, the equipment is in our backyard or a friend's backyard. The rest of us are GCOC "Facilities Using" members with access to the GCOC agility field. In short, if you have the basic skills, have decided that agility is your dog sport, and are committed to getting better in a fun and supportive environment ... then The Agility Co-operative wants you! Where does the journey end? Well, actually, never! You can reach goals that you set for yourself, ranging from simply perfecting a skill, to entering your first trial, to earning titles, maybe even to winning a national championship. But you are never done training your dog. If you are interested in joining The Agility Co-operative, email us at the link below. For more information about the Greater Columbia Obedience Club's agility program, please send us an email.